Announced during the Summer 2016 Wonder Festival toy show, Persona 5’s protagonist is getting a collectible Figma figure direct from Max Factory and Good Smile Company. With the prototype shown at the Winter Wonder Festival and a colorized version on display just last week at San Diego Comic-Con, pre-orders are now officially open for the future collectible. Standing at approximately 15cm/5.9in. 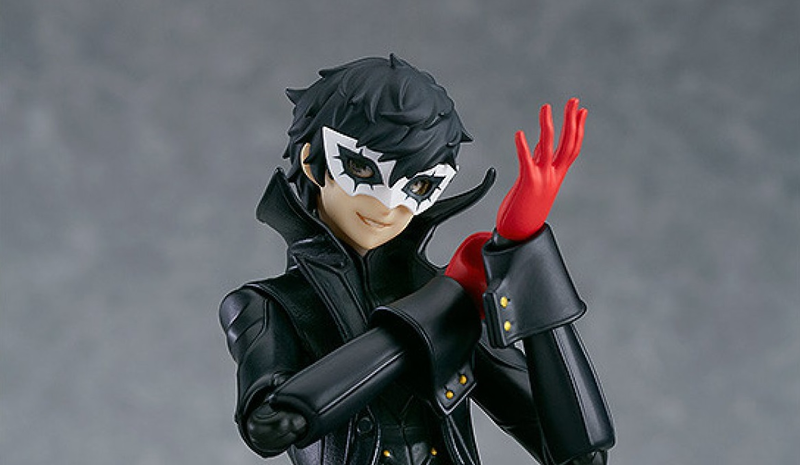 from his feet to the crest of his hair, the Figma “Joker” depicts the Persona 5 protagonist clad in his “Phantom Thieves” uniform. Three interchangeable faces are included, depicting neutral, smiling, and mischievous expressions; additional display parts include a knife, gun, and alternate hair piece allowing Joker to be displayed with his mask. Morgana, the feline component of the Phantom Thieves is also included with the Joker figure, but exact dimensions of the second, much smaller figure have not been given. The Persona 5 “Joker” Figma collectible from Max Factory and GSC is currently available to pre-order via Play-Asia, AmiAmi, the official GSC online store and other import retailers for roughly $49.99-$61.99; the figure is also listed on Solaris Japan, but is not yet ready for purchase. Collectibles are expected to begin shipping in late-January/early-February 2018. Persona 5 is currently available for the PS3 and PS4.